When fall rolls around and butternut squash is in season again, my heart goes pitter-pat because I know that I get to make this recipe: Roasted Butternut Squash Spinach Salad with Chicken. It truly is one of my favorite dinners to make during October and November. And for several years in a row, it’s occupied the highly-coveted space of the “vegetable dish” that I bring every year to my family’s Thanksgiving celebration. Maybe it’s the wonderfully caramelized butternut squash seasoned with the flavors of chili powder, ginger, garlic and cumin. Or perhaps it’s the sweetness of the maple syrup in the apple cider vinaigrette drizzled over fresh Granny Smith apples. 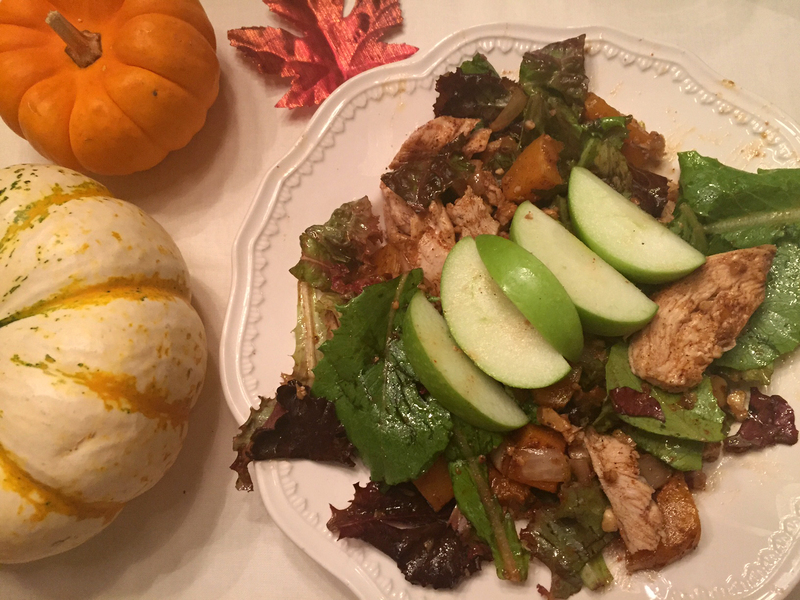 Either way, you’ve got to try this healthy and delicious salad that captures all the flavors of the fall season! Place the cubed and peeled butternut squash along with the chopped onion in a large bowl and add 2 tsp of the minced garlic, cinnamon, cumin, ginger, chili powder, olive oil, maple syrup, salt and pepper. Toss all ingredients to coat. Arrange the seasoned butternut squash and onion mixture on a cookie sheet and bake for approximately 25-30 minutes at 425 degrees or until the vegetables are fork-tender and caramelized-looking. Stir once during the cooking time. While the veggies are cooking (and your kitchen begins to take on the dreamy aroma of cumin, chili powder and maple syrup), thinly slice the apple, chop the walnuts, and chop up the greens. Mix together the remaining minced garlic, olive oil, apple cider vinegar and 2 tbsp maple syrup with a whisk in a small bowl to make the marinade. Once veggies are done, allow them to cool slightly for a few minutes. Add the greens, chicken, walnuts and dried cranberries to the bowl. Top with the cooked veggies and the marinade. Mix everything together well. Garnish each plate with a few slices of apple on top and serve immediately. Enjoy!